It doesn’t matter whether you work on a construction site, in a hospital, or in an office, the best work pants are a staple anyone’s wardrobe. With the right number of pockets, they can even make your job easier. We researched a variety of different styles and brands to put together this work pants buying guide to help you find the right fit. Before we get started with our reviews, let’s take a look at some of the key features you need to know. Material: Work pants have to be comfortable and be able to take a bit of a beating. They’re usually made of cotton or a cotton blend. Some even have reinforced knees and extra durable stitching to help them last even longer. Color Options: The number of color options varies a lot. Usually, pants that are meant for contractors only come in a handful of basic colors. But there are a few options on our list that come in up to 20 different options. 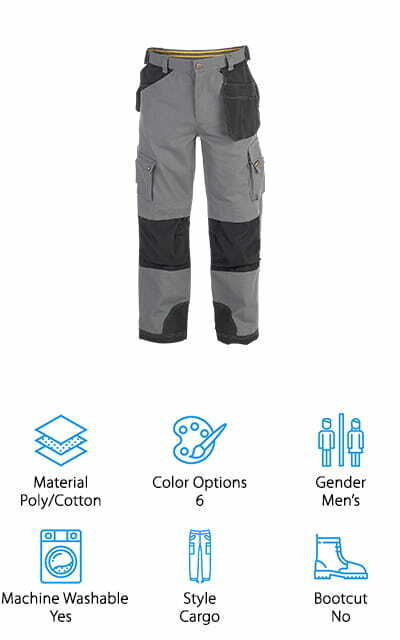 Gender: Most of these are designed for men, but if you’re a woman who needs a really durable pair of work pants, there’s no reason you couldn’t order a pair. That said, there are a few that are specifically targeted to women. Machine Washable: Let’s face it, if you’re working somewhere where you’re bound to get particularly dirty, it’s important that you can just throw your pants in the when you get home. Luckily, most of our list is machine washable. Style: There are a few different styles available but the most popular is cargo pants. That’s more than likely because cargo pants have so many pockets and, as we said before, pockets are pretty important. Especially when it comes to work pants. Bootcut: We don’t necessarily mean bootcut like the style of jeans. What we mean here is, are these pants made to comfortably fit over a pair of work boots? Some of them are, some of them aren’t. It’s up to you what you prefer! 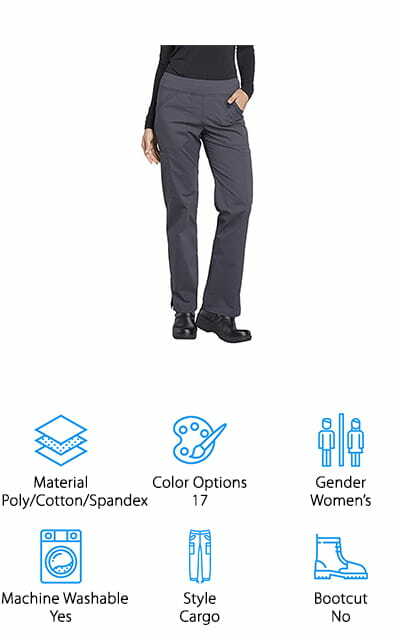 Now that we’ve covered the key features, let’s take a look at our work pants reviews. Here’s how it works. We put our top and budget picks first. That’s the best place to start if you’re in a hurry to get a good idea of the kind of things that are available. Keep reading to learn about the rest of our picks. They’re all really unique and you should check them out. Alright, let’s get right into our reviews. 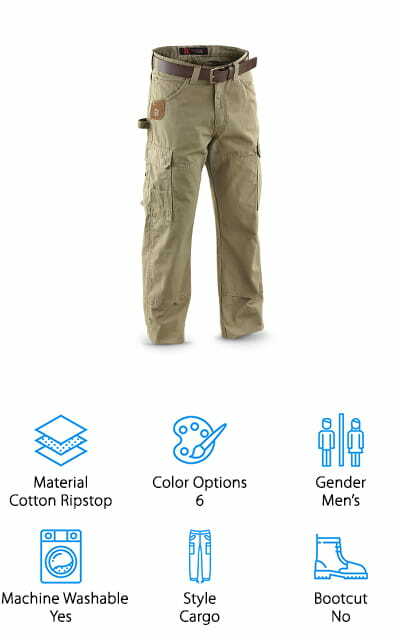 Wrangler RIGGS Ranger pants are our top pick for best cargo pants for work. They’re one of the well-known brand’s most popular styles and for good reason. They’re made out of durable cotton ripstop and are cut to give you room to move in the set, thighs, and knee without being too bulky. And get this: there are so many pockets! The rear pockets are each 13 inches deep and lined with Denier Cordura, a tough fabric made to withstand abrasions and tears. There are 2 front pockets and the right side has a leather tape measure reinforcement. That’s not all, there are 2 side cargo pockets with hidden snap closures, too. It’s not hard to see why these pants are so popular. There’s a place for just about anything you’ll need during your day. Our pick for best cheap work pants comes from one of the most well-known brands. Dickies Original 874 Pant are tough and have a classic fit that tapers in the legs. One of the best things about these pants is that they’re wrinkle resistant and have built-in stain release. You can get them pretty dirty and know that, once you throw them in the wash, they’ll come out looking clean and ready to start another day. Plus, they have a permanent crease so you never have to worry about looking unprofessional. It’s no wonder this style has been around for more than 50 years. These pants are great for just about anywhere, from a machine shop to the office our out on the weekend. And get this: they come in 20 different colors. The best work pants for carpenters that we found are Carhartt Original Fit Dungarees. They have a relaxed for and are made of 100% cotton denim so they’re comfortable and breath easily. If you’re looking for a pair of pants with pockets to spare, this is the one for you. There are 8 in all, including reinforced rear tool and utility pockets and even a hammer loop. The wide leg fits easily over your work boots without bunching up. They’re to give you a lot of freedom of movement, too. The seat and thigh are generous and the natural waist is really comfortable. They come pre-washed so you shouldn’t have to worry about any shrinkage. You can throw them in the washer and dryer, too, of course. There are 3 different denim colors to choose from. 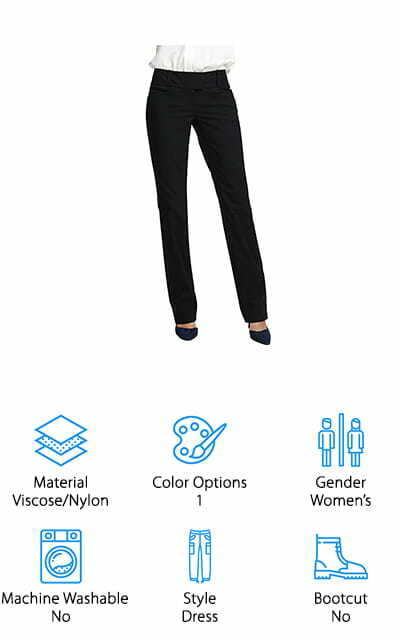 Dickies Women’s Stretch Twill Pants are our pick for best work pants for women. They’re made mostly of cotton but do have 3% Spandex that gives them just the right amount of stretch. The waistband is contoured which prevents gapping the back. As for pockets, there are 2 rear welt pockets and slanted hand pockets on the sides. Not only are they available in 3 different colors, you can also get them in 3 different lengths, too. So, if you’re petite or tall and have a hard time finding work pants, these are a great one to try. You can put them in the washing machine, but make sure you use cold water and no bleach. Then, tumble dry on low and use an iron on low heat it needed. 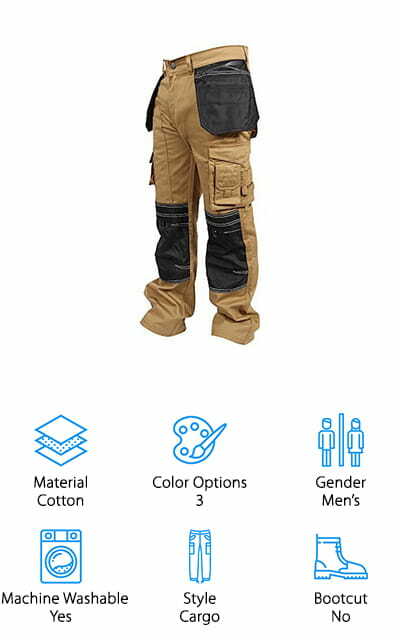 Next up is another option for the best work pants for men, CQR Men’s Tactical Pants. They’re designed to look a bit like military or law enforcement style pants with a little more of a casual feel. That’s not all, they have a lot of pockets. In fact, one of the pockets even has a pocket. There are 8 in all, including 2 rear, 2 cargo, and 4 front pockets. These pants are made out of Duratex fabric that repels dirt, liquids, and other contaminants. You can toss them in the washing machine at the end of the day, too. Plus, they’re fade, shrink, and wrinkle resistant so you’ll always look professional without having to get out the iron. They’re available in about 20 different colors, too, so you’re sure to find one that goes with your style. 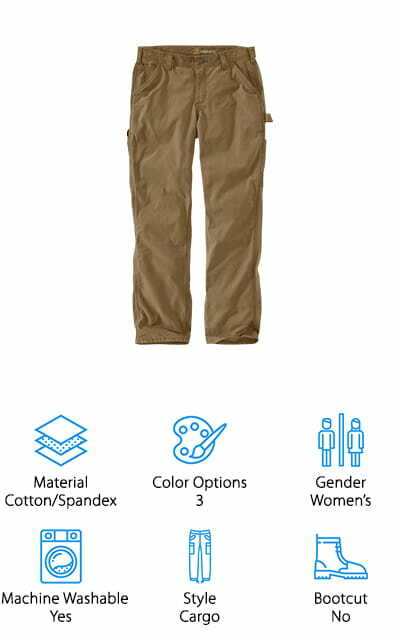 Caterpillar Men’s Cargo Pants are the best work pants for construction workers that we included in our reviews. They’re a seriously durable utility pant that has gripper tape in the inner waistband and tool holders on the sides. There are bellowed cargo pockets on each leg, front slash pockets, a cell phone pocket on the right thigh, and 2 pull out nylon tool bags in the front. If you tend to be tough on your work pants, don’t worry, the cotton polyester blend canvas material is durable. For extra protection, there are polyester oxford panel knees with scuff guards that stand up to most abrasions. The crotch gusset and articulated knees give you a lot of freedom of movement and they fit nicely over your boots. 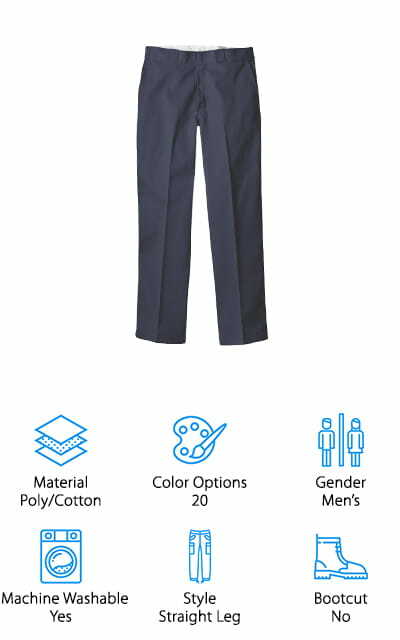 These pants are machine washable and available in 6 different colors. If you’re looking for the best construction work pants for women, Carhartt Women’s Crawford Pant is the one for you. They’re mostly cotton but have 2% Spandex for just the right amount of stretch. They have a good amount of flex and aren’t prohibitive when you move even though they’re slightly fitted throughout the hips and thighs. They also have a medium to high waist with a contoured waistband to prevent gaps in the back. There are 6 pockets in all: 2 in the rear, 2 in the front, and 2 cargo pockets. All of these pockets are deep and roomy so you can actually put stuff in them without having to worry about anything falling out. All of the main seams are triple stitched for added durability. Choose from three different colors: coal, dark brown, and yukon. 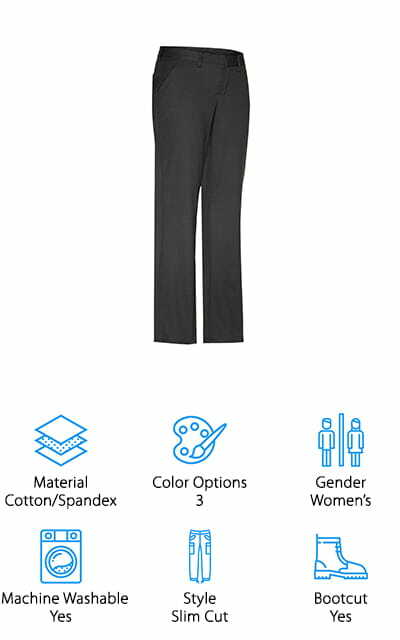 Cherokee Women’s Cargo Scrub Pants are the best stretchy work pants for women. Scrubs are supposed to be comfortable. That’s why the cotton, polyester, and spandex poplin blend is soft and breathable with just the right amount of stretch. The missy fit has a roomy cut that won’t prohibit movement at all. They’re generous with pockets, too. With 2 in front, 2 in the rear, and 2 cargo pockets, you have more than enough room for everything you’ll need to carry with you during your shift. Another unique thing about these pants is the waistband. It’s wide and ribbed for extra support without digging into your skin. These straight legged scrubs are available in petite and tall. If you wear scrubs on a regular basis, you know how hard that can be to find. 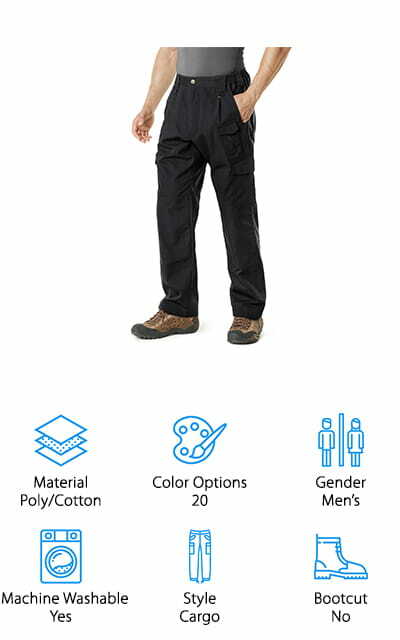 For the best work pants for sale that are versatile enough for a lot of trades, take a look at the Newfacelook Cargo Work Pants. They’re made of 100% cotton with reinforced Cordura knees. Since the knees are usually one of the first places work pants wear out. By reinforcing the knees with something so durable, you can expect these pants to last a long time. Another great thing about them is they have so many pockets. Not only that but some of them are oversized and reinforced so they’ll have no problem carrying your tools. There are even knee pockets where you can add in knee protection if you want. 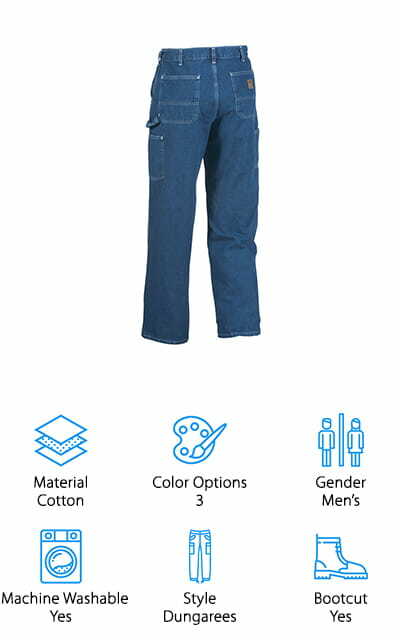 These pants are ideal for any kind of construction or heavy duty work. They’re available in 3 different colors and various sizes and lengths, too. Last up are the YTUIEKY Stretch Work Pants. Ladies, these are our pick for the best work pants for curves. The fabric is really soft and comfortable. It’s also lightweight and doesn’t get as dirty as other fabrics do. Plus, they’ll go with just about anything. The classic ponte style is only available in black but, to be honest, that’s really all you need. These pants look great with dress shirts, cardigans, sweaters, and blouses. You could even dress it down with a tee-shirt if you wanted to. They keep their shape really well and give good support and contour. The zippers are also tough and pretty high quality and won’t wear out easily. Which is good to know because these pants are so versatile, we suspect you’ll be wearing them a lot.